Drake is working on a new album and you can tell, apparently, by the bags under his eyes. Nobody on the Jezebel staff is recording an album (well, as far as I know. I don’t want to assume) but that doesn’t mean we don’t know what it’s like to look like a haggard, dark-eyed ghoul. Right, Drake? Which is to say, we have some skincare recs that could help lighten, brighten, and moisturize his under-eye area. These Smoothing and Relaxing Klorane under-eye patches are great for sticking in the fridge and putting on right when you’ve woken up, giving your eyes a cool wake-up call. Clover Hope recommends Burt’s Bees Nourishing Eye Cream, which is hydrating but gentle, and contains “royal jelly” (Hope says: “I don’t know what royal jelly is.”) And neither do I! From Kelly Stout comes a recommendation for Kiehl’s Avocado Cream, which is great for sensitive skin. Joanna Rothkopf says Tarte’s Maracuja C-Brighter Eye Treatment is solid, and Madeleine Davies thinks Drake should use a Milk Cooling Stick for his dark circles, which seems perfectly low-maintenance and easy to carry around when you’re moving from your private jet to your recording studio to your private jet to your recording studio, etc. Then there are, of course, tools. Julianne Escobedo Shepherd says an Ice Roller might do the trick, like this one from Vanity Planet, and Megan Reynolds suggests a jade roller because, you know, why not? Nothing but the best for Aubrey Graham. Reynolds also recommends belif’s Moisturizing Eye Bomb, which is great for every skin type since I, personally, don’t know what Drake’s skin is like. Is it dry? Is it oily? Is it combo? Do you know? 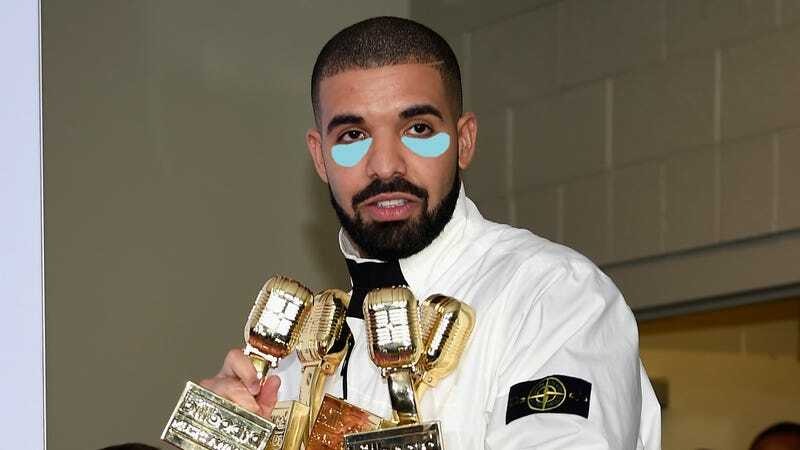 Drake, take care of yourself. Jezebel has some other skincare recs for you, when you’re ready.